PureView Imaging Technologies: It is a new handset powered by Belle operation system (formerly known as Symbian). The keyword for this new smartphone is "PureView imaging technologies" - which are essentially a combination of the high-quality Carl Zeiss optics that we all know and love, high-resolution sensors and sophisticated software with a 41MP camera. Yes, that's right: a forty-one megapixel camera. 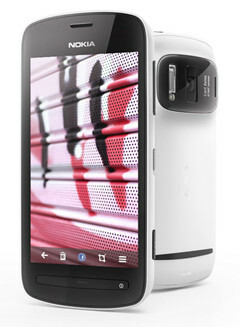 The Nokia 808 PureView is the wonderful smartphone for people who like to take pictures on the go. Of course, for those who are still have some loyalty to Nokia. As the first 41MP camera smartphone, this USP is attractive. Besides, it is with a 4-inch screen for watching amazing videos you capture or the videos you saved in SD card. Video codec supported by Nokia 808 PureView is H.264 (base profile, main profile, high profile), MPEG-4, VC-1, Sorenson Spark, Real video 10. Wanna watch your favorite DVD movies with Nokia 808 PureView? As we know, movie DVDs are with copy protections like CSS, RC, RCE, APS, UOPs, ARccOS, etc., which pretends you making copies. That is not easy to convert or do something with your own encrypted DVDs. It is a problem until you use Any DVD Cloner Platinum – the complete DVD cloner and DVD ripper. 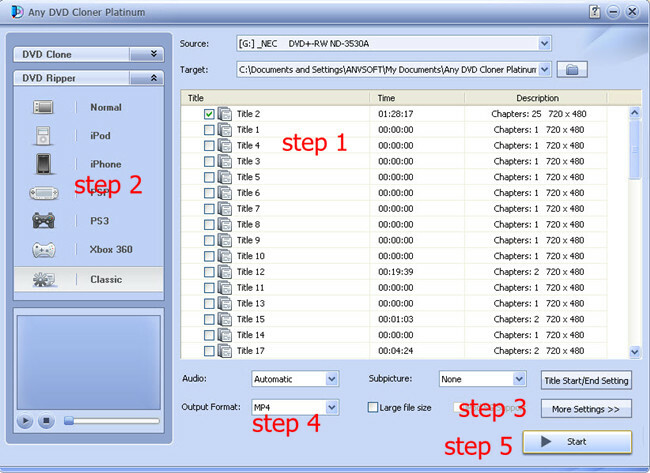 Any DVD Cloner Platinum is an all-in-one DVD cloner and DVD ripper software for decoding DVD copy protection, clone DVD to DVD, copy DVD on hard drive. What's more, ripping DVD to videos with five different video codec is another important function. 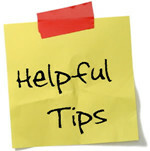 Want to watch your favorite DVD movies with Nokia 808 PureView? Try Any DVD Cloner Platinum! Step 1: Install Any DVD Cloner Platinum on PC, and insert DVD into DVD drive. For Mac users; please go to Any DVD Cloner Platinum for Mac. 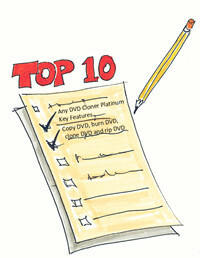 Step 2: Launch Any DVD Cloner Platinum, and click "Open DVD"; and DVD titles would be listed in the ripper. The longest title of the whole DVD movie will be selected by the program automatically. If you need to rip other titles, you can select them manually. Step 3: Go to "DVD Ripper" operation panel, choose "Normal". You can see "MP4" is selected in "Output Format". It means a MP4 video file will be generated after the ripping process is done. Wanna Change the video codec for the output file? Easy! Click "More Settings" button, go to the customized operation panel. Step 4: Click "Start", let the ripping process starts. When the ripping process completes, a window will popup and you can see the output video file, transfer the file to Nokia 808 PureView SD Card, and you can watch movies freely!